These knives can be used for different proposes, such as animal killing, bloodletting, skin prepeeling, brisket cutting, offal and viscera removing, trimming, deboning and cutting, etc. These knives are imported from Brazil, and of high quality, will make sure long service time, and also will save your cost. 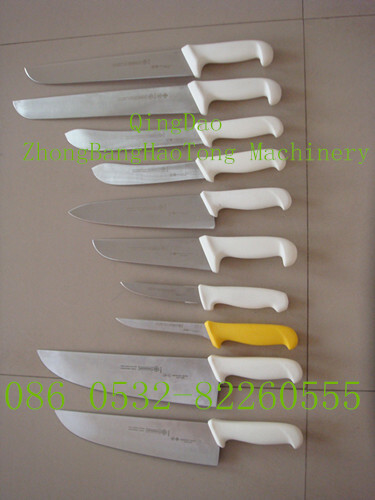 We offer these knives as auxiliary materials for our slaughterhouse machines, and will offer them as request. ZBHT Slaughtering Machinery Co.,Ltd. manufacturing high-quality Slaughter knives-Butcher knives and supply OEM, ODM service according to your personal requirement. Our Slaughter knives-Butcher knives and other Auxiliary Equipment And Tools is not only good in quality but also competitive in price, welcome to inquiry us about the details of Slaughter knives-Butcher knives or other slaughtering machine products and accessory equipment.